Ok, quick review time with the obligatory disclaimer: This treat was bought with a free coupon from the generous folks over at Edy's ( Dreyer's ). 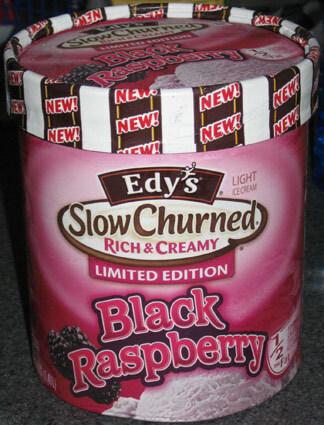 You know, I was about to ping Edy's for downgrading Black Raspberry to a limited edition flavor. Like many of their other flavors, I thought they had knocked it down to slow churned status and then declared it a "NEW!" product. The truth is, I don't think they ever had it as a full time flavor. I even did some digging and I can't find any signs of it. Weird. I'm just so use to everyone having a raspberry flavor that it never even dawned on me they didn't. Well, let's see how this light ice cream is. Hmm, looks fairly airy as you might expect. I dig myself a bowl and do my sampling thing. Shocking... I don't really like it. I know I tend to be vague when I don't like something to a mild degree, but this isn't good ice cream. A good black raspberry needs a nice clean taste and texture, and this has neither. I can forgive one, but not both, though it does earn a little forgiveness for being very low fat. I just can't recommend this. My wife concurred, though she helped me finish it anyway. If you are hoping for a raspberry fix, this ain't it. 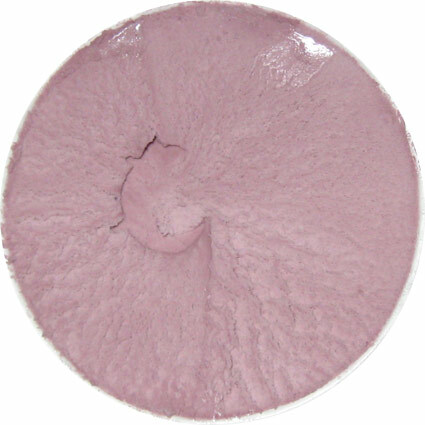 It seems like your problems with low fat ice cream come from airy texture, not with flavor. Texture aside, is the flavor bad? I just can't see myself NOT liking a flavor like black rasperberry. I felt that it had almost a faint gummy texture. This seems fairly typical for dairy desserts, but I am not certain if this was listed as a "dairy dessert". Basically, in my opinion, it did not have the same texture as ice cream. Also, I could taste a hint of cream cheese flavoring. I don't believe that this product contains cream cheese, though. I love cream cheese and it was lower on the calorie scale so that is why I finished this. @Adam: No no, the flavor is definitely off here. It's not horrible, but it ain't right. Haha, fair enough. So Dubba, since you never seem to finish up the low fat stuff, mind sending me your leftovers haha! Thanks for the review. I'm always on the lookout for a tasty ice cream that's somewhat a healthier option. I might try this if it's on sale. I bought this for my sister for her birthday because she loves black raspberry ice cream. She loved it. Maybe it's not for everyone but she's pretty picky and she thought it was great. I just had some, and I thought it was delicious! Like a raspberry sundae without the high calorie raspberry topping. Only 90 calories! Yup, all the Edy's (Dreyer's) cartons have been redone for 2012. I don't know if they've tweaked this particular recipe at all though. This ice cream is amazing! I loved it last year when I tried it and fell in love with it all over again this year when it came back. I wish they'd keep it as a permanent item! This is the best ice cream for the calorie . I have been waiting all year for it's return. I don't understand why they don't have it year round. Yeah, most companies keep their black raspberry flavor all year long, Edy's is the only one that comes to mind that doesnt do this.